Letters from the Street has been carefully arranged into three parts – Features, Tributes and Interviews. This you will agree is an excellent compartmentalisation acceptable in standard journalistic circles. This has made it easy for the reader to distinguish whose opinion you are reading, who has provided the facts, whose interests the facts are serving, etc. Leafing through the pages of this book, you are not in doubts about this. The distinction and clarity are crystal clear for all to see. Whether it is the Features section, the Tributes or the Interviews, you are confronted, face to face, with articles and contents well researched and in–depth. The presentation style is pretty straight forward to make it easy for the ordinary man on the street with a fair fluency in the English language to be able to read and understand. There is no bogus use of high sounding words, no verbosity in being over-detailed, no over-emphasis. In short, the writing has seen a transformation of the writer from a trained Performing Arts graduate to a full blown journalist. Again, the training in Performing Arts came in handy in the presentation of perspectives with an infusion of dramatic effects in terms of the choice of words, with visual and picturesque connotations and denotations. Moreover, in the series of interviews published, the book presents a string of attempts – a failed one though – at nation-building in Nigeria. The challenges at nation–building, the issue of leadership, the matters of corruption, greed, ineptitude, conflict and competition for power, the abuse of power, etc., are presented for our leaders and politicians to learn from history and correct the course of a repeat of our inglorious past. For those singing and dancing to the drums of war-mongers in Nigeria, the interview with Pa Jen, a first and second world war veteran, gives a conclusion to the matter. War is evil, it destroys only. Read it up in this book. Journalists, because of space constraints in the print, have fashioned a unique way of writing, which succinctly puts the information across, and addresses the essentials needed by the reading Public. Journalistic writing tools and style, I am educated, are captured in the five Ws and H – WHO did WHAT, WHEN, WHERE, WHY and HOW? I have seen a generous dose of this deployment throughout the length and breadth of this book. It is a nice piece of journalistic artistry. The ultimate goal of every journalist is to serve as a catalyst for societal development and advancement. This is done by giving ‘voice’ to the voiceless, highlighting the cause of the oppressed, defending the defenceless, challenging the ‘status quo’ and holding government accountable to the people. From the ordeal of Citizen Ibrahim Abiodun in the land of liberty, the Ifowodo episode, to the Tongedi Island neglect and abandonment, Letters from the Street has attained the ultimate – from my point of view – in the quest for societal change for the better. The book has come at the right time to provide deeper and better perspectives to our struggle as a nation on the way to nationhood. As a matter of fact, as politicians jostle for 2019, we see a repeat of those issues and events that characterised the days of the Babangida and Abacha transitions and self-succession attempts. The catch is, whether at all as a people, we have learnt from history. The spate of insecurity in the land, the state of the economy, the level of poverty and hunger in the land, have challenged each and everyone of us to re-dedicate ourselves to the cause of common good and societal development. This, in my opinion is what Semiu Okanlawon has set to do by putting together this book at this auspicious time in history. 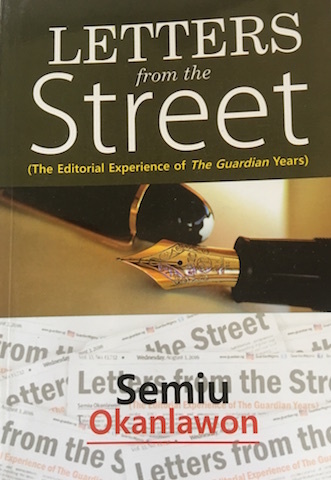 I, therefore, commend Letters from the Street as a reference material for students and scholars alike in history, politics, law, arts, and, in fact, all fields of human endeavour and all those genuinely committed to a better Nigeria. Jeleel Ojuade, a professor, is director, Advancement Centre, University of Ilorin, Nigeria and president, Association of Dance Professionals and Scholars in Nigeria.